Keeping Up With The Family: Two Little Ducks, Legs Eleven, Two Fat Ladies, Guess Where I Went! Two Little Ducks, Legs Eleven, Two Fat Ladies, Guess Where I Went! 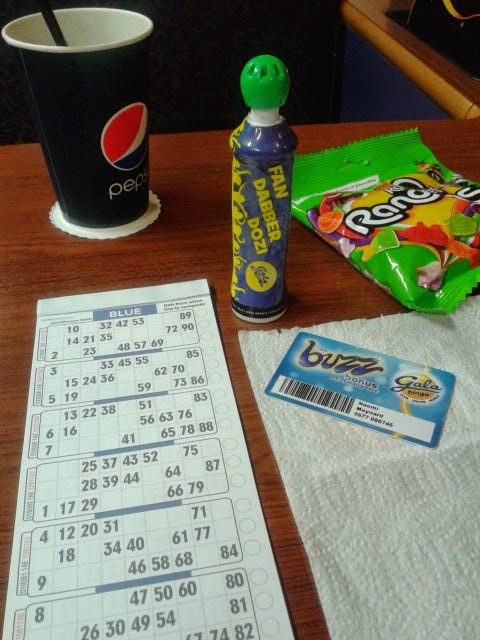 A few weeks ago a friend of mine went to play Bingo. She's been to LasVegas and isn't shy of a little gamble. Me either and I never seem to win the lottery so I thought I may have more luck, and fun, playing Bingo. There were three of us going and we met outside the GALA Bingo hall on Monday night. To start with you have to sign up, but it's free! No doubt my email inbox will fill up with offers to start playing on-line but you can opt out of any emails. The lady on the desk was extremely helpful and I got a new shiny card to join the other hundeds of loyalty and store cards lurking in my purse. The main ticket is a book of bingo sheets. Each sheet has six bingo cards and each card is colour coded so you know which card you should be playing. The special ticket is just one bingo card but it's linked with other GALA bingo halls across the country with a large prize fund. Before we started there was time to buy a drink and snacks, even a main meal that would be delivered to your table if you wanted it. I bought a fizzy drink but had brought my own snacks in with me. At your table there are coin slots and you can play on an electronic board that slots into the arm of the chair when not in use. You can watch the numbers being called on a large screen and again is linked with other players. At one point there were over 6,000 players, on a Monday night and not even for the main event. I was very surprised by that figure. Looking around, being at the 40 middle aged bracket; it was also suprising to see such a mix of age ranges from early twenties to the golden oldies. Eyes down it was time to start the first half. My friend had bought a "dabber" pen to mark our numbers off. I do love pens but I wouldn't be able to take this home, the four year old would be on it like a shot and my house would be "dabbed" all over. The first numbers are called out, they are also displayed on a screen just in case you can't hear it so well. I got lost a few times and it's a real struggle to try and catch up. I also kept forgetting if I was only looking for one line, two lines or a full house. Memory isn't my strong point. In the end I marked the top of each card with one dab when we only wanted one line, two dabs for two and three for a full house. My previous experience of bingo had been in a church hall with my Mother in Law. When numbers were called out, so did most of the audience with "bingo lingo". This was far too professional and I was disappointed I didn't get to shout out clickety click or two little ducks. Having said that, the silence is deafening. All those people concentrating. After the first five cards there was a 25 minute break, then we were back again for the special ticket then back to the last five cards. Unfortunately I didn't even get close enough to finishing one line let alone a full house. Luck of the draw I guess but you'd think they'd let the newbies win! I'll be back next month trying my luck. Desperation Diet.... It Starts Today! The Girl Who Said "I Don't Feel Very Well"
The Prompt: TV Could You Live Without It?